The dust has settled on the 2017 NFL season, capped by an incredible run by the Philadelphia Eagles and their Super Bowl LII victory. 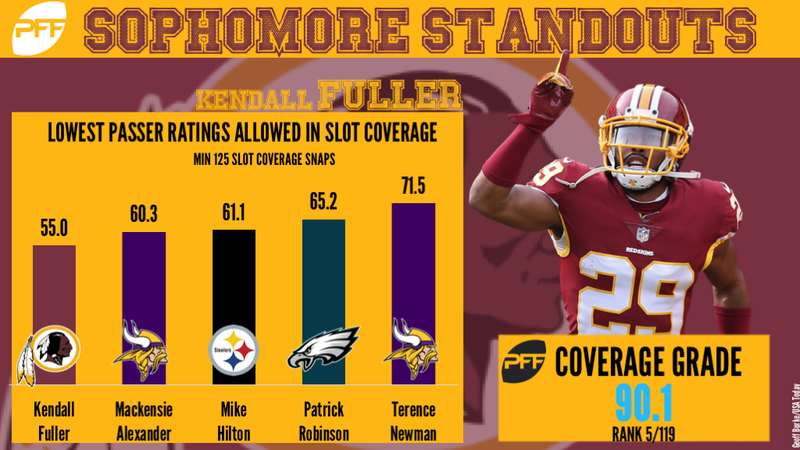 Sifting through the plethora of data we have at our fingertips at PFF and coinciding with the release of our Top 101 players from the 2017 season, PFF’s Mark Chichester takes a look at the highest-graded second-year players regardless of position from the 2017-18 campaign. Following an impressive rookie year in 2016, the former Ohio State Buckeye kept his foot firmly on the gas throughout the 2017 campaign and proved to be a vital component of an offense that fell just inches short of an NFC Championship appearance. In his 16 regular season games, Thomas was targeted on 25.9 percent of quarterback Drew Brees’ pass attempts, which makes him the most targeted player of Brees’ career within the PFF era (2006 – present). Thomas ended the campaign averaging 2.39 yards per route run, which was tied for the league’s fourth-best mark among receivers with at least 45 targets. 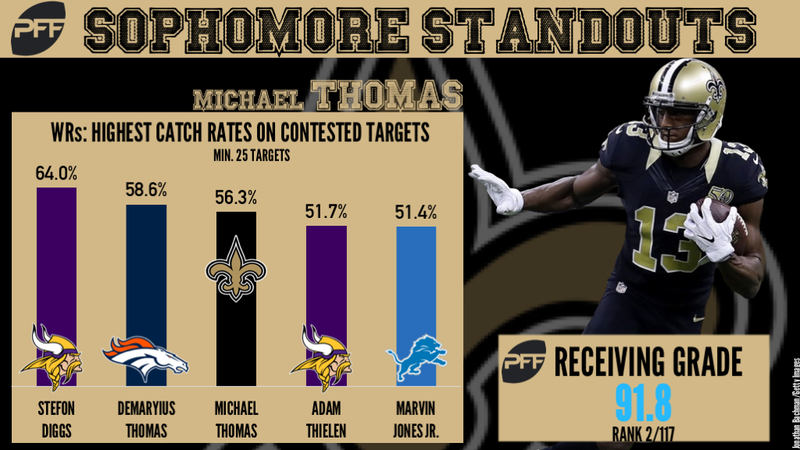 Throughout the season, Thomas excelled in contested catch situations and fielded a catch rate of 56.3 percent on his 32 contested targets, the third-best mark among receivers. He ended the season with an ‘elite’ receiving grade of 91.8, which was the second to only Antonio Brown this year, which in and of itself tells you all you need to know about the exceptional year that Thomas just had. While Ramsey’s year didn’t quite end the way he so infamously predicted, the second-year cornerback still enjoyed a spectacular season, which has ultimately led to him being mentioned as one of the best players at his position. This year, Ramsey allowed just 51.1 percent of the targets into his coverage to be caught and surrendered a passer rating of just 63.9, which ranked 13th and 10th among 86 cornerbacks with at least 32 targets in coverage, respectively. Throughout the campaign, Ramsey’s aggressive and physical style helped him become one of the league’s most effective playmakers against 50-50 balls and on the 31 contested catches that were sent into his coverage, he logged more combined interceptions and pass breakups (13) than receptions allowed (11). Ramsey ended the season with a coverage grade of 91.8, which was second only to Casey Hayward this year, and it’s become quite clear that Ramsey has a bright future ahead of him. After a stellar first season where he earned Defensive Rookie of the Year honors, the 22-year-old defensive end continued right where he left off and ended the 2017 season firmly among the NFL’s elite class of pass-rushers. 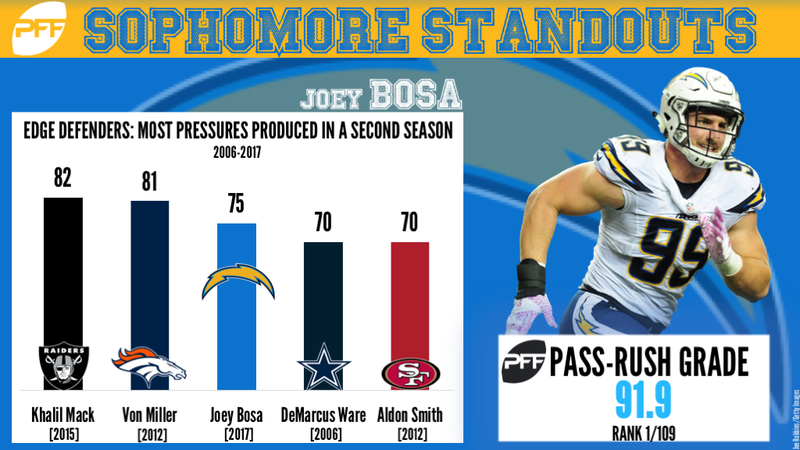 This year, Bosa produced a whopping 75 total quarterback pressures, which was both the seventh-most among edge defenders this year and the third-most ever recorded by a second-year edge rusher. Over the last two seasons, Bosa has racked up a combined pass-rushing productivity of 12.8, the fourth-best mark among all edge defenders with at least 500 snaps in their first two seasons. Bosa’s reign of terror against opposing quarterbacks was highlighted by an elite pass-rushing grade of 91.9 this year, which tops all 109 qualifying edge defenders, and after two dominating seasons, it appears that the sky really is the limit for the former Buckeye. After a productive rookie season in 2016, the former first-round pick took a big step forward in Year 2 and is well on his way to establishing himself as one of the most disruptive interior linemen in the game. Buckner dominated as a pass-rusher for most of the season and tallied four sacks, 19 hits and 29 hurries on his 475 pass-rushing snaps, which earned a pass-rushing productivity rating of 8.4, the 11th-best among interior defenders with at least 130 pass-rushing snaps and the best mark among all second-year interior defenders. Buckner also impressed against the run and racked up an impressive 27 run stops over 16 weeks, which tied him for the 10th-most among players at the position. Over his first two seasons, Buckner has been an iron man in the San Francisco 49ers‘ trenches and has logged more defensive snaps (1,873) than any other interior defender and after ending the year with a near-elite pass-rushing grade of 89.6, it’s clear that the Niners have found a defensive cornerstone that the team can build around for years to come. In last week’s surprise trade, the Kansas City Chiefs not only acquired a third-round draft pick from the Washington Redskins, but they also acquired one of the best young defensive backs in the league who is just coming off a stellar sophomore campaign. In what only can be described as a reverse sophomore slump, Fuller enjoyed a spectacular breakout season, which saw his grade increase from the 45.5 that he earned a season ago to an elite 90.0 in 2017, which ranked fifth among players at the position. Throughout the 2017 campaign, Fuller proved to be a versatile playmaker, capable of playing both inside and outside, but he really excelled when covering the slot this year, where he allowed a passer rating of just 55.0, the best-mark among slot cornerbacks with at least 25 targets. With a secondary room that now holds Fuller, Marcus Peters and safety Eric Berry, the Chiefs arguably possess one of the NFL’s best secondaries heading into 2018. When he was selected with the 52nd overall pick of the 2016 draft, few people would have predicted that Jones would develop into one of the best coverage linebackers in the NFL, but over the last two seasons, Jones has done just that. His play this year was highlighted by his elite coverage grade of 94.8, the second-best mark ever recorded by a linebacker. Through 17 weeks of the regular season, Jones allowed an average of just 0.74 yards per coverage snap, which was the ninth-best mark among linebackers this year, and over the course of his two-year NFL career, no linebacker has more combined pass breakups and interceptions than Jones’ 19. His startling speed and athleticism allow him to match up against virtually any player on the field, as evidenced by his passer rating of just 52.6 he allowed when covering wide receivers, which is by far the best mark among linebackers with at least 10 targets while covering wide receivers. Jones’ game-changing ability has almost single-handedly transformed the Atlanta Falcons defense and figures to be a key weapon for years to come. After missing his entire rookie season due to injury, the former first-round pick more than made up for it in his second year and returned to his dominant college form to immediately improve the Cincinnati Bengals‘ secondary. 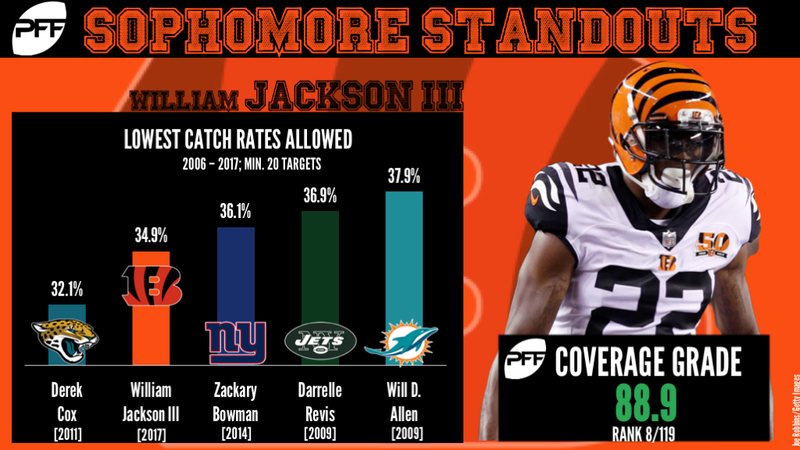 Through the regular season, Jackson allowed just 34.9 percent of the targets thrown into his coverage to be caught, which is not only the best mark among cornerbacks this year, but the second-best mark ever recorded by PFF. All told, he surrendered an average of 0.38 yards per coverage snap and a miniscule passer rating of just 36.1, which ranked first and second among 124 qualifying cornerbacks, respectively. After completely dominating in what was essentially his first year in the league, Jackson not only established himself as the team’s best cornerback, but one of the very best shutdown corners in the NFL. 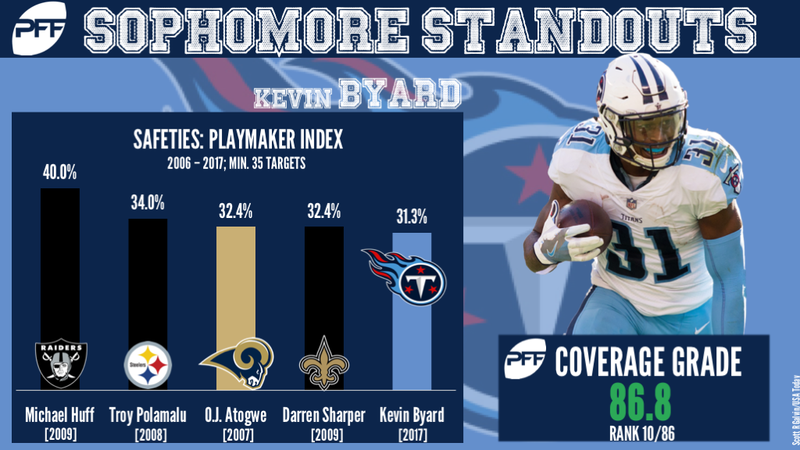 In 2017, the Tennessee Titans’ secondary saw a huge improvement compared to 2016, and nobody quite encapsulates that improvement more than former third-round pick Kevin Byard, who went from zero INTs in 2016 to a league-leading eight INTs in 2017. Through the regular season, no safety played more coverage snaps than Byard, who logged an incredible 643 and despite this only allowed an average of 0.52 yards per coverage snap, the fourth-best mark among safeties with at least 35 targets in coverage. The ball-hawking safety was targeted 48 times during the season and, staggeringly, logged 15 combined interceptions and pass breakups, giving him a playmaker index of 31.3 percent, which was not only the best mark among safeties this year, but the fifth-best mark ever recorded by a player at the position. One of the better success stories of the 2017 season, second-year cornerback Trevor Williams went from snagging one of the last spots on the Chargers’ roster to becoming one of the better cornerbacks in the league. Williams greatly exceeded expectations this year and was mightily productive in coverage, where he allowed an average of just 0.82 yards per coverage snap, which was tied for the 14th-best mark among qualifying players at the position. Where Williams really excelled was his coverage against the deep ball. Through the regular season, Williams saw 20 targets that traveled at least 20 yards downfield but he allowed just four of them to be caught, while tallying one interception and six pass breakups, which was tied for the most among cornerbacks. All told, Williams allowed a ‘deep’ passer rating of just 49.6 and ranked ninth among corners with at least 15 deep targets, while his playmaker index of 35.0 percent ranked third. Prior to tearing his MCL in his team’s wild-card loss to the Tennessee Titans, Jones enjoyed a mightily productive sophomore campaign and has arguably developed into one of the league’s best interior defensive linemen. Through the regular season, Jones was incredibly disruptive, both against the run and as a pass-rusher. In 16 regular season games, Jones racked up 38 pressures from his 398 pass-rush snaps, which resulted in a pass-rushing productivity of 7.5, the 18th-best mark among interior linemen and the third-best mark among second-year players. Jones appeared to be almost unblockable at times this year, so if he’s able to make a full recovery from his injury, he clearly has the potential to be an elite-level talent at the position.